STM set out to raise the quality and standards in the rail industry. To deliver training internally to the group and also primarily to external companies. We now deliver nationally to several major Train Operating Companies, Local Councils, and Security Companies, as well as bespoke training to various other commercial organisations. The Accredited Persons training is aimed at people who have an interest in maintaining safety within their community / railway environment. It is suitable for those who work or want to work in some of the following roles: rail enforcement officers, travel safe officers, railway community officers, community wardens; neighbourhood wardens; community support workers etc. The term 'Accredited Person' is used to describe someone who is employed by an organisation (other than a police force) in a railway / community safety role, who has been accredited by a Chief Police Officer This qualification, explores various areas including diversity and discrimination issues in the community. The Training is a totally up to the minute five day classroom based course, available to organisations and their employees that are involved with community and railway safety, enabling them to be eligible for police accreditation. “An excellent trainer, utilizing humour, examples, exercises and “bringing the unexpected” to the group as a process to understand in an informative and to me unique approach to instruction”. 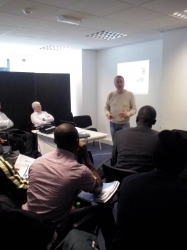 “Course was made interesting by Jeff, covering the relevant points and including the class in discussion and questions”. The Accredited Persons training is aimed at people who have an interest in maintaining safety within their community / railway environment. It is suitable for those who work or want to work in some of the following roles: rail enforcement officers, travel safe officers, railway community officers, community wardens; neighbourhood wardens; community support workers etc.’ The term 'Accredited Person' is used to describe someone who is employed by an organisation (other than a police force) in a railway / community safety role, who has been accredited by a Chief Police Officer This qualification, explores various areas including diversity and discrimination issues in the community.